My daughter loves her Rainbow Loom. She doesn't use it. That is why she has me. Her big idea this year was to make a bracelet for each of the kids in her class this year for Valentine's Day. And I thought this was a great idea... until I realized *I* would be the one actually making the bracelets. (I think I see a fine motor skill project in her future). I made a bunch of fishtail bracelets. The darker ones are for the boys and the lighter glitter ones are for the girls. These were made weeks ago. But they need a card. I have seen several very cute ideas out there with various play on the words "rainbow" "loom" and "band". 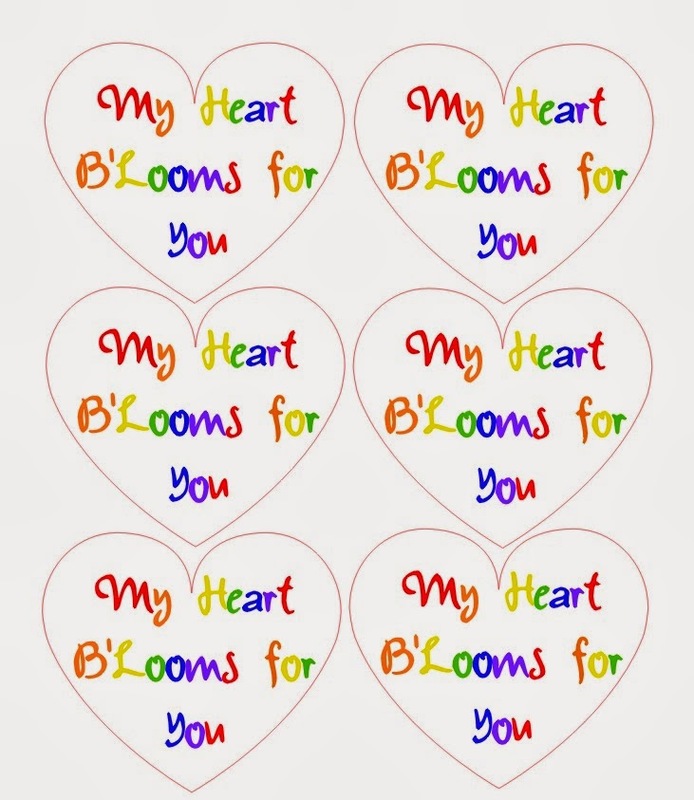 After poking around I decided to go with "My Heart B'Looms For You." Here is the card I came up with. The letters are rainbow colors inside a heart. I will have my daughter sign her name on the back of each card. I cut these with my Silhouette but you can certainly use scissors. I used a hole punch to punch out the two holes at the side of the card then scissors to cut from the edge of the heart to the hole. The bracelet slips into these holes pretty well. Click here to go to my Google Drive where you can download this card in PDF format or the Silhouette Studio file. These are so cute! I've heard so much about the Rainbow looms, but I've never tried them. Amazing, will have to remember to make one of these for hubby soon. Pinned!! Thanks for sharing...my 9 yo daughter is loom-crazy right now and she would really enjoy this! Super cute! My daughter had to have one of these looms, maybe she can make something like this one. Thanks for linking up to Snickerdoodle Sunday. Awww....those are cute. I just made some similar. Looms are all over this house lately. These are so cute. What clever gift ideas. My neighbor's daughter does this all the time. I haven't done it, but may with the grand kids. Very cute idea for the little ones to work on for Valentines day. what a cute idea! Thanks for sharing it for MMM link up party this week! These are so cute! You are a great mom for making these for your daughter! What a cute idea for Valentine's Day! Thanks for sharing!